Cliff Stamp had issues with the Millies liner lock opening while torquing the knife to split apart wood. I recreated the issue with my own Millie at the time. I remember being surprised by his results and wanted to see it happen for myself, as the Millie was my EDC back then and I had 100% faith in the lock. I never had the lock release during regular use, but I can see how the large cut-out can be a concern when twisting the knife around during hard cutting tasks. I'd take a comp lock over a liner lock for hard use, partially for that reason. During hard cutting tasks I'm usually wrapping my thumb around the handle, so it'd be very difficult to release the lock with side to side pressure. My thumbs are so long they never sit on the lock release, even gripping say, my Szabo Folder behind the index choil. That is not hard use, that is inappropriate use of any folder. Splitting wood and wacking the spine is seriously the wrong tool for the job. Thanks for the info on torque release that is very good to know what not to do. Do you think a Frame lock would behave in a similar fashion? Jumping back into this, I would still prefer a backlock military or some derivation of a back lock mechanism. Would also like an PM2 XL or maybe a PM2 XL Lite (4.5 inches, frn, 2mm blade stock). I do prefer a compression lock to a liner lock. 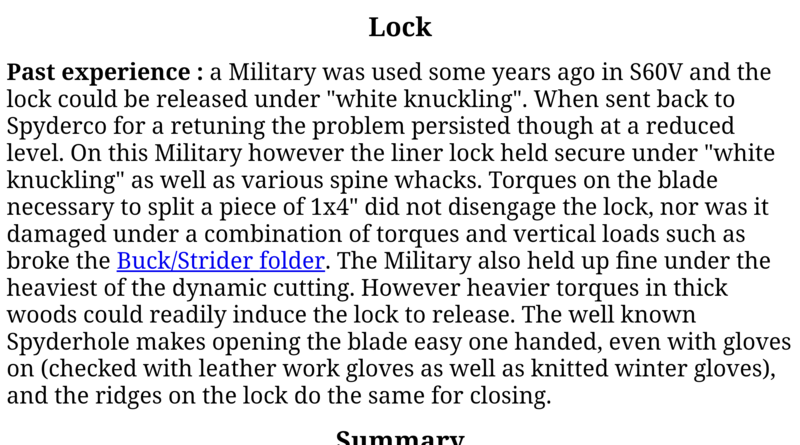 While the military is easier to close with gloves, I have absolutely no problem closing a comp lock with gloves on. This is just my imagination, but imagine a tip up military with a comp lock and an Emerson wave. I could go for a back lock or even a how to say this? Back lock midway through I guess a mid lock? You can replicate this issue by whittling a branch and twisting the handle to break off shavings, which is a far cry from abuse. Or slicing cardboard, having the knife stick, and teisting the handle side to side to wiggle it free. Frame locks have the same issue. It's good to be mindful of this, especially on knives with a large cut-out like the Millie. None of this is to imply the Millie is a bad knife. I EDC'd one for four more years after reading this review and replicating the issue. But I'm glad I was made aware of the potential for this to happen, because it made me more mindful of how I use my liner lock folders. I absolutely agree (I generally trust spyderco liner locks as well), but it's not a very relevant point. The point of these tests are to identify weaknesses in the effectiveness of the lock, which is important for when mistakes are made. You can have nothing but good and proper intentions regarding knife use, but it won't make the effects of lock failure any safer on your fingers. You simply can't control everything, and extra protection is always a plus. And if a lock WERE to fail, it's nice knowing what would be most likely to cause it. Last edited by Pelagic on Fri Dec 07, 2018 12:23 am, edited 1 time in total. Thank you it is very important to know the failure points of any tool and how to avoid them. Thank you twice now you have helped me better understand how to avoid a potential tragedy. I do hope I have helped others also, I love my Compression Lock knives but they are not without safety concerns. While I love the compression lock it's release is vulnerable to mishandling (Misplaced Thumb) by the end user and is it's only practical drawback. I feel like "mishandling" could make any lock vulnerable but that's user error. ANY type of lock has its potential failure points; none are perfectly risk-proof. Even Cold Steel's much-vaunted Triad Lock. While I've never had one fail on me in the locked position, the worst knife-related injury I've ever experienced was when I stupidly tried to one-hand close a Code 4. Once unlocked, the blade swung shut on my index finger very suddenly and quickly, like a guillotine. Yes, it was user error on my part, as I should never have tried to one-hand close it, but it still held that potential danger. I badly cut the tendon of my right index finger at the last knuckle, near the fingernail. Put me out of work for 4 months (my work depends on the full use of my hands). The finger was splinted/kept immobilized for 2 months, then 2 more months of physical therapy. So even if a lock is less prone to failure while engaged, safety in how the knife operates during the unlocking phase is every bit as important. The ironic thing is, in over 40 years of using knives, I've never had a non-locking, slip-joint pocketknife close on me during use or while closing it. Therefore, I view blade locks as safeties put in place to simply lessen the chance of an accidental closure, and therefore, I treat any folding knife as I would a slip-joint. Mishandling is one thing. A design which allows for easy unintentional lock release is another. I will not call it a flaw but it is a safety issue not present in other locks. The Mili and the Para are not the same! I have thought long and hard about this topic and as much as I love the compression lock, I would rather have a backlock on the Millie. I would buy one yesterday if it had a backlock. There are only two knives with liner and frame locks that I put up with; The Mantra 1 and the BHQ Chinese Folder. They are so good, I overlook the locks. They would still be better without a liner lock. Yep I will buy 1 with a back lock and even more than 3 if the steels are the ones I like. Heck I would even buy at least one with a compression lock for that matter. I think the concept of a Para XL deserves its own thread. Back lock freakin’ Milli would be awesome! I could see that potentially dethroning the Police 4 as my favorite. Especially if it were a golden back lock like on the native 5. I've never had this happen to me with any compression lock folder that I have. It seems like you're blaming the knife for lack of awareness. I guess you and I just hold knives very differently. Last edited by 5-by-5 on Sun Dec 09, 2018 12:19 pm, edited 1 time in total. I am glad you never had this happen to you. There is no blame only fact, the lock can be easily disengaged by placement of the hand while in use and that is a safety issue to be aware of. Argue that if you wish, it is what it is. I will not respond to any more of your comments on this for fear of drawing unwanted administrative action.